BJ's Restaurant & Brewhouse debuts new Slow-Roasted Tri-Tip as well as a few dishes featuring the new beef option. 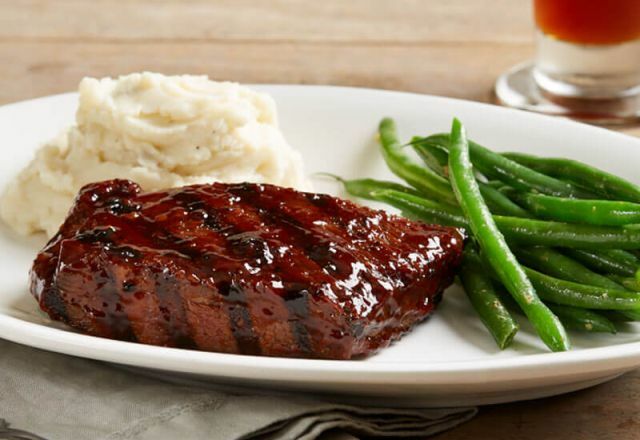 The Slow-Roasted Tri-Tip entree features slow-roasted sirloin tri-tip with Big Poppa's Double Secret Steak rub and BJ's Peppered BBQ sauce along with two sides of your choice. The new tri-tip is also featured in the new Tri-Tip Wedge salad, new BBQ Tri-Tip Sliders, and new Brewhouse Philly sandwich. The Tri-Tip Wedge salad includes a wedge of iceberg lettuce, sliced tri-tip, BJ's Peppered BBQ sauce, applewood-smoked bacon, blue cheese crumbles, red onions, tomatoes, blue cheese dressing, and chimichurri sauce. New BBQ Tri-Tip Sliders consist of sliced tri-tip, BJ's Peppered BBQ sauce, and BBQ ranch on mini buns. Sliced dill pickles come on the side. The Brewhouse Philly sandwich features marinated, slow-roasted tri-tip, provolone cheese, sauteed mushrooms, caramelized onions, and pepperoncinis on a toasted hoagie roll. Coleslaw and fries are included on the side. Photo BJ's Restaurant & Brewhouse.